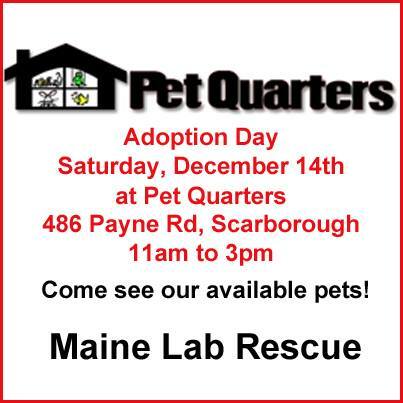 PLEASE SHARE: Join them on Saturday, December 14th at Pet Quarters, 486 Payne Rd, Scarborough, ME for an adoption event. They’ll be on site from 11:00 am to 3:00 pm. Meet the Maine Lab Rescue volunteers, learn more about fostering and meet their available pets! We can’t say enough good things about Maine Lab Rescue! Maine Lab Rescue is not for labs only… and they rescue cats, too! This entry was posted in General, Rescue Organizations, Volunteering and tagged adopt, cat, dog, foster, Maine Lab Rescue, rescue. 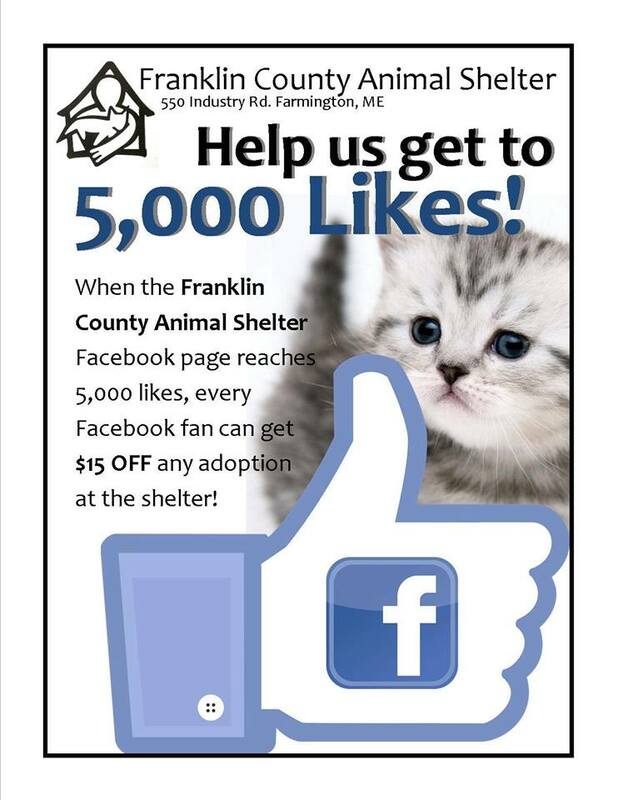 Help them get to 5,000 likes on Facebook… when they do, every Facebook fan get get $15 off any adoption in the shelter! As of 5:00 am, Tuesday, December 10, 2103 they’re at 4,771 likes… not all that many left to go! The purpose of Franklin County Animal Shelter is to provide temporary care and shelter to stray, homeless and abandoned companion animals. Medical treatment including vaccinations and sterilization is provide to all animals prior to adoption. FCAS serves the community as an adoption facility where loving families and pets needing homes come together. The Shelter strives to educate the public in the proper care of pets including increasing public awareness of the companion animal overpopulation issue. 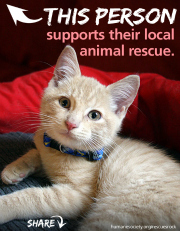 Did you know that the adoption fee only covers 25% of what each animal costs the shelter? This entry was posted in General, Supporting Other Organizations and tagged advocacy, animal overpopulation, animal welfare, cat, dog, Franklin County Animal Shelter, kitten, puppy, rescue, shelter, shelter challenge, volunteer. Never Give Puppies or Kittens Away for Free! I’ve been amazed recently by the number of people who STILL don’t realize they a) should never ever give a cat or dog away for free, and b) who think their pets are safe running around loose. Years ago we were told not to advertise “free kittens” or “free puppies”, because there were those nasty creatures out there who would take them and then sell the animals to testing laboratories. More recently, the dregs of humankind will take the animals and use them as live bait in dog fights. On one animal group on Facebook, a lady said, “Oh, it’s okay. I check them out to make sure they’re dressed well and have a decent car before I give them the puppies”. How clueless is that? Here’s the most recent from the Humane Society of the United States. You can scan the article below, or click on the link to see the pictures and get more information. Can you imagine dogs sold by an unscrupulous animal dealer to a laboratory to endure painful procedures, and dying — all for the sake of an unnecessary experiment? 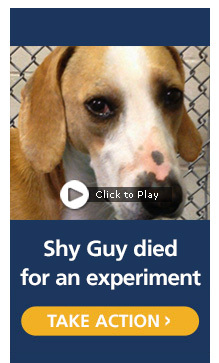 That was the fate of dogs like Shy Guy who were sold to Georgia Regents University by a Class B animal dealer, subjected to cosmetic dentistry experiments, and then killed. Shy Guy had his teeth removed and replaced with implants. Then he was killed — just for a small sample of his jaw bone. Random source Class B dealers who sell animals to research institutions round up dogs and cats from “random sources,” such as auctions, flea markets, and other questionable means — some of them were even family pets. The notorious Class B dealer with whom Georgia Regents University is doing business has been formally charged by the USDA with a series of legal violations. This entry was posted in Animal Safety, From the News and tagged advocacy, animal, animal welfare, bait, cat, dog, dog fight, dog fighting, expose, free puppy, Georgia Regent, kitten, laboratory, pet, puppy, test labs, undercover. Reprint from HSUS. Click on the link below for more info. 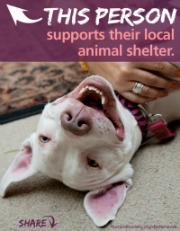 Shelters and rescues are amazing! They help untold numbers of animals and people, usually with limited resources and very little publicity. Do you want to give back to the these unsung heroes and organizations who contribute so much to your community? Try one—or all—of the following ten ways to help shelters and rescue groups. Don’t be surprised if you end up feeling good and having fun. Tell the world how you feel about your local shelter or rescue by using The Humane Society of the United States’ Facebook share graphics. Start the process by locating all of the ones in your area. You may be surprised how many groups nearby are helping animals. Before you adopt, go to the Shelter Pet Project to learn what to expect when adopting a pet. You’ll be much less likely to become frustrated and return your new pet if you understand the challenges and rewards of adopting a pet beforehand. Take a minute to express your gratitude to the people who work at your local shelter or rescue groups. If you’ve adopted a pet from one of them, show how well your pet is doing by sharing an updated picture via a letter, email, or posting it on the organization’s Facebook page or website. Combine fabric, yarn, recyclables, and imagination to bring much-needed fun into the lives of local shelter and rescue pets. There’s no end to the toys you can make. Try braiding strips of fleece into fun for dogs, or cutting and folding a surprising household object into a cat distractor. Are you a born match-maker? Create attention-grabbing “Adopt-Me” vests to spotlight available pets at adoption events held by shelters and rescues. We’ve found DIY options for those of us who avoid sewing as well as sewing-machine wizards. “Like” the Shelter Pet Project on Facebook. Then, if possible, “like” the individual groups in your community, too. Shelters and rescue groups always need towels, toys, and other supplies. Check their websites for wish lists or call them to find out what’s in short supply. Even if you can’t adopt a pet just now, you can help make life better for homeless animals by volunteering with your local shelter or rescue organization. Do you have experience as a carpenter or electrician? Are you a marketing or dog-walking whiz? All of these skills are valuable! Make the jobs of shelters and rescues easier: Outfit your cats and dogs with collars and proper ID (a microchip and ID tags) at all times. As soon as you bring them into your family, have all of your pets spayed or neutered. Keep your cats indoors, where you can keep them safe (though it’s great to take them on walks if they are comfortable on a harness and leash), and keep dogs on leashes when off your property. If you see or hear anything at your local shelter that concerns you, follow The HSUS’s guidelines for addressing that concern in the most effective way. This entry was posted in Supporting Other Organizations and tagged cat, dog, HSUS, rescue, shelter, volunteer. I don’t know anything about these meetings… do any of you? This is just a copy and paste from the maine.gov website. Note: Some documents are provided in Microsoft Word format (MS Word). Download the free Word Viewer if you do not have Microsoft Word on your computer. Rich Text Format (RTF) documents may be viewed in any word processing software. Next year (2014), we will produce three pet shows, the Greater Portland Pet Expo on June 5-6 at Seasons Conference Center (off Exit 48); the Greater Bangor Pet Expo on September 12-13 at the Cross Insurance Conference Center in Bangor, and the Greater Androscoggin Pet Expo on September 26-27 at the Lewiston Armory on Central Avenue. We’re also slowly working on developing a non-profit to raise funds for animal rescues – AARF – Animal Activist and Resource Fund. You can read more about AARF at https://www.facebook.com/AARF.AnimalActivistResourceFund. We foster dogs through two rescue organizations (Maine Lab Rescue and The Pixel Fund), and collect donations for several rescues, including Tommy’s Feral Feline Friends. For more information on any of our efforts, please contact Linda at LSnyder (at) regroupbiz (dot) com. 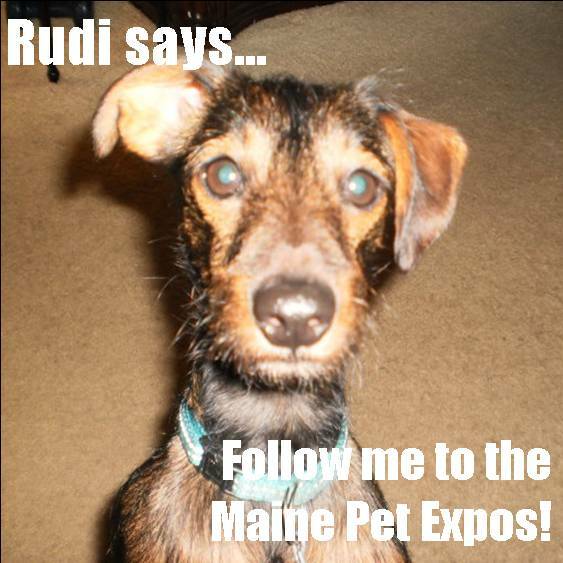 And if you’d like to read random thoughts about our dogs, please follow us at http://themainedogblog.wordpress.com. This entry was posted in General and tagged animal, animal welfare, cat, dog, Maine, rescue, shelter. Would You Pay Extra to Reduce Your Pet’s Pain During Surgery? GOOD NEWS – Pet owners – would you pay $100 to vastly reduce pain during a pet’s surgery? Read on. 09.16.13. reprint. see link below. Demand for laser outfitted Veterinarian operating rooms used to be about the same as demand for animal organ transplants. But like most technology, the price has come down, and it’s beginning to infiltrate the pet world. Lasik surgery on the eyes has certainly earned a reputation for fast, incredibly accurate, and well understood technology that people now routinely choose as option to correct vision. It’s also found its way into other procedures for humans. Now it’s available for pet surgery. For spaying female pets, it’s all about the difference between cutting with a scalpel and cutting with a laser. Both work fine to get the job done, but laser cutting does a number of things that scalpels do not. Burning rather than cutting kills bacteria. Bacteria live on skin by the trillions. They also hang out in in tissue, blood vessels, and the lymphatic system, even after you scrub the surfaces. When you cut with a sterile scalpel, you just move the bacteria aside. But when you burn the incisions, you kill the ones on the edge. This reduces the exposure to infection. Burning seals off vessels that cutting leaves gaping open. When you cut through any tissue, you are severing hundreds of vessels that carry blood and liquid through the body. When you sew up afterwards, all those little vessels remaining open, which ooze. Oozing establishes little rivers of water for bacteria to swim up into a wound. Lasers seal all those vessels so they don’t ooze. The results? For $75 to $100 more money, your pet will recover faster, suffer less pain, have less stiches (with no outside stiches that have to be removed) and face less risk of infection. This entry was posted in From the News, General and tagged animal, cat, dog, kitten, managing pain, pet surgery, veterinarian. This entry was posted in Designated Non-Profit, Supporting Other Organizations and tagged Androscoggin, animal, barbecue, cat, designated non-profit, expo, feral, fund-raise, Greene, kitten, Maine, rescue, Tommy's Feral Feline Friends.